To live together in harmony is an essential attribute for us human beings. To learn together enriches our heart, to grow together develops trust, and to live together gives us joy. 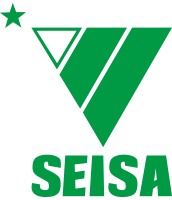 These are kept by all people involved with SEISA. The name “SEISA,” comes from a Chinese classical literature, “star raft,” which is said to be a raft one rides from the sea to the Milky Way. A raft is built with the combination of long logs, short logs, and all sorts of logs with different hardness, thickness, colors, kinds and properties. The uneven logs can create a solid raft by taking advantage of the different characteristics of each log. SEISAʼs philosophy, “Kyosei” (living together in harmony), coincides exactly with the idea of the star raft. Just as the different kinds of logs make use of their strength and supplement each other to make a strong raft to be able to ride from the sea to the Milky Way, we are in search of a way for people to acknowledge and accept their differences and live together in harmony with nature and different societies. Materialize what people from society want, find new paths to achieve what is necessary and accomplish them. Open up new paths for students who need them, and strive to create a world in which all people could live together in harmony. Nurture young adults with strong hearts who could care for others even at times of hardship and who could confront hard ship with courage and a smile.